Indications: Kidney Yin Deficiency, Blood Deficiency; Yin represents substance, blood and tissue in the body and can be consumed by prolonged stress. 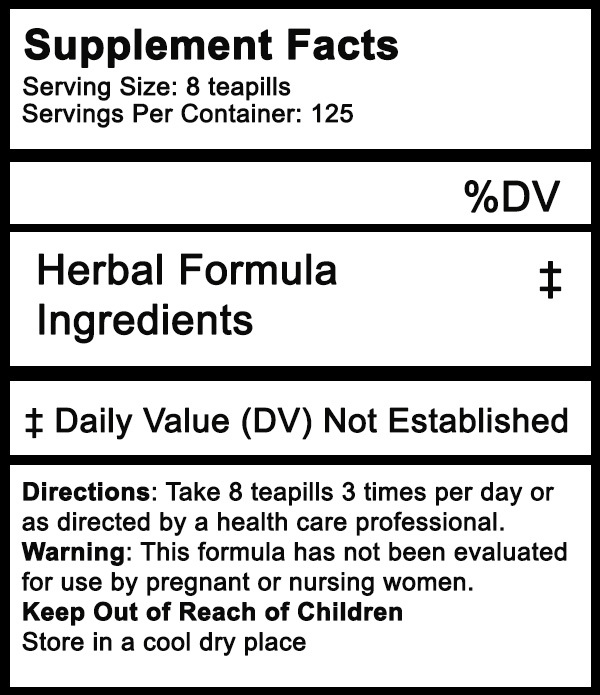 Warning: This formula has not been evaluated for use in pregnant or nursing women. Rehmannia glutinosa prepared root, shu di huang, or Chinese foxglove root cooked in rice wine nourishes Blood, Kidney Yin, and Essence (Jing) and enters the Heart, Kidney, Liver energetic organ systems. Althaea officinalis root, or marshmallow root is a western herb with Yin demulcent qualities that aids the absorption of the formula. Paeonia lactiflora root, bai shao, or white peony root is used to preserve Yin, soothe the Liver, nourish the Blood, and reinforce the Wei Qi. Lycium chinense fruit, gou qi zi, or goji berries is used to build Blood and is used with patterns of Blood and Yin Deficiency, and Essence (Jing) depletion. Goji is specific for Yin and Blood Deficiency relating to Liver Yin Deficiency, Kidney Yin Deficiency, and Lung Dryness. Polygonum multiflorum root, he shou wu, or fo-ti is a major Chinese herb used for Yin, Blood, and Essence (Jing) Deficiency of the Liver and Kidney energetic organ systems. Also extinguishes Internal Wind. Sesame Indicum seed, or hei zhi ma is a Yin tonic that nourishes Kidney Yin and Liver Yin while clearing Deficient Heat caused by Yin Deficiency. Schisandra chinensis fruit, or wu wei zi enriches Kidney Yin and binds the Essence (Jing). Scrophularia spp. herb, xuan shen, or figwort herb and root is used creatively to clear Heat in this formula as well as nourishing Yin. "Metabolomics study of hematopoietic function of Angelica sinensis on blood deficiency mice model." Li PL1, Sun HG1, Hua YL1, Ji P1, Zhang L1, Li JX1, Wei Y2.J Ethnopharmacol. 2015 May 26;166:261-9. doi: 10.1016/j.jep.2015.03.010. Epub 2015 Mar 20. "The effects of Liuwei Dihuang on canonical Wnt/β-catenin signaling pathway in osteoporosis. Xia B1, Xu B2, Sun Y2, Xiao L3, Pan J3, Jin H4, Tong P5." J Ethnopharmacol. 2014 Apr 11;153(1):133-41. doi: 10.1016/j.jep.2014.01.040. Epub 2014 Feb 12. "Comparative pharmacokinetics of catalpol and acteoside in normal and chronic kidney disease rats after oral administration of Rehmannia glutinosa extract." Zhao M1, Qian D1, Liu P1, Shang EX1, Jiang S1, Guo J1, Su SL1, Duan JA1, Du L1, Tao J1. Biomed Chromatogr. 2015 May 29. doi: 10.1002/bmc.3505. "Hot water extracted Lycium barbarum and Rehmannia glutinosa inhibit liver inflammation and fibrosis in rats." Wu PS1, Wu SJ, Tsai YH, Lin YH, Chao JC. Am J Chin Med. 2011;39(6):1173-91. "Goji (Lycium barbarum and L. chinense): Phytochemistry, pharmacology and safety in the perspective of traditional uses and recent popularity." Potterat O1. Planta Med. 2010 Jan;76(1):7-19. doi: 10.1055/s-0029-1186218. Epub 2009 Oct 20.